Contemporary luxury living in this highly specified and spectacular hillside villa, overlooking Chaweng bay and Koh Matlang. Amenities satellite 55"+60" TVs, iPod dock, air-conditioned bedrooms, ceiling fans throughout, fully equipped kitchen, wine cellar, intercom, WiFi broadband internet, Jacuzzi. Baan Fan Noi is a fabulously styled hillside home, overlooking Chaweng bay, with stunning sea and sunrise views. Designed in contemporary Balinese-Australian minimalist style, and generously proportioned, the villa offers impeccable luxury in a seamless indoor-outdoor living space, with meticulous attention to detail. The villa is built on three levels that cascade down the sea-facing hillside. The upper level consists of 3 en-suite double bedrooms, all with A/C, ceiling fan, King-size beds, built-in wardrobes with personal safe and mini-bar, and access onto a large balcony through French doors. The en-suite bathrooms all feature oversized rain showers, black granite sinks, and private walled gardens, 2 of which have oval terrazzo tubs. The slightly larger master bedroom also features a large flat screen TV with satellite and surround sound that is piped into the bathroom. Elegant limestone stairways connect the 3 floors. The second level houses a fully-fitted and equipped kitchen, with a breakfast bar and granite counters, and is separated by a limestone deck from the vast, open-plan living room. The living room is floored in light tiles, and includes a bar, which can be concealed by foldaway doors. There is a dining table for 6-8, numerous sofas, armchairs and loungers, a large satelite TV and surround sound speakers. The living room is dramatically lit, with dimmer-controlled lighting and concealed ceiling lights. The foldaway glass walls open onto a surrounding balcony, which overlooks the swimming pool and sea views beyond. The gentle sea breezes and array of ceiling fans provide ample ventilation. 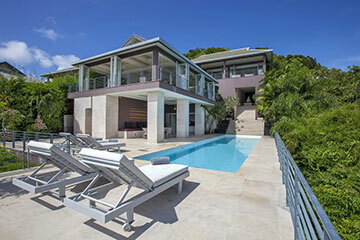 A wide flight of stairs leads to the third level, where the extra-long lap pool extends towards the sea view. The vast limestone deck, with a sunken Jacuzzi and an open-air shower, continues into a shaded lounging area under the living room. A fourth en-suite bedroom, with a round double bed and a mini-bar, is located behind the pool area. An additional bathroom with shower is located off the pool deck. Daily maid service is provided, in addition to breakfast and airport transfers. An experienced and capable team of staff is at your disposal to cater to your every whim. The main tourist area of Chaweng, 2 minutes drive away, offers a 5 km white powder sand beach, and a plethora of excellent restaurants, bars, nightlife, shopping, and spas. The villa is located on a hillside, about 3 minutes drive from the heart of Chaweng, 5 minutes from Choeng Mon and the airport, 15 minutes from Bophut Fisherman’s village, with Santiburi Golf and Country club some 30 minutes drive away. -Rates are inclusive of continental breakfast and airport transfers, one trip each way. *A security deposit of $1000 USD is required on arrival, to be refunded on departure, less any damages or outstanding bills. 10% discount until 10 January 2019. Applicable to all occupancy rates, and cannot be used in conjunction with other promotions. 10% off within 15 days of arrival. Applicable to all occupancy rates, and cannot be used in conjunction with other promotions. Not applicable to Xmas/NY.